Pileus: hemispheric to convex; 60 – 90 mm diameter; fibrillose and glutinous at first, becoming dry; datebrown, dark brown chestnut brown; margin inrolled becoming upturned at maturity. Stipe: cylindrical to slightly clavate; 60-110 × 10-12 mm; fibrillose; dry; yellow brown to ochre with small squamules from the veil. Gills: adnate to adnexed; brown to rusty brown; margin dentate. Flesh: brown beneath cuticle and at stipe margin. 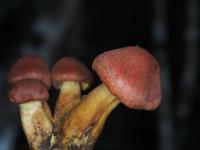 Notes: this Cortinarius is one of a species complex with violaceous tones that are difficult to separate. It is likely to be a new species.